An excellent primer on the Buddha’s life and teachings. Departing from her usual Judeo-Christian stomping grounds (The Battle for God, 2000, etc.) 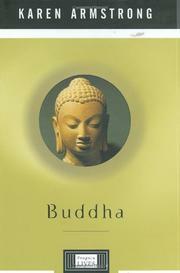 to pen a biography of Siddhatha Gotama (circa 563-483 b.c. ), Armstrong admits up front that she has set herself no easy task. The little information available about his life simply will not “satisfy the criteria of modern scientific history.” In addition, Gotama himself would likely reject an effort to chronicle his doings, as “throughout his life he fought against the cult of personality and endlessly deflected the attention of his disciples from himself.” In response to these difficulties, Armstrong has produced not so much a rendering of the few extant details of Gotama’s quotidian life, but an account of how his circumstances led him to develop one of the great religions. She makes vivid the vanished world of the turbulent Ganges basin from outlines provided by the earliest texts available, those written in the North Indian dialect of Pali and preserved by Buddhists in Sri Lanka, Burma, and Thailand. Beginning with Gotama’s rejection of his family to join one of the many bands of mendicant monks in search of a higher truth, Armstrong creates a profile of an intensely practical man. When he cannot reach Nirvana using any other teacher’s practice, Gotama makes up his own, rejecting “abstruse theories about the creation of the universe or the existence of a Supreme Being” in favor of a series of practices to be strictly followed. The resultant religion was based entirely on actions and was open to all, something truly revolutionary in a land whose culture was based on an unshakable caste system. Armstrong details these practices and theories and also provides an invaluable glossary. Those who wish to acquaint themselves with how Buddhism came to be, and with the individual who created it, will find this an essential text.